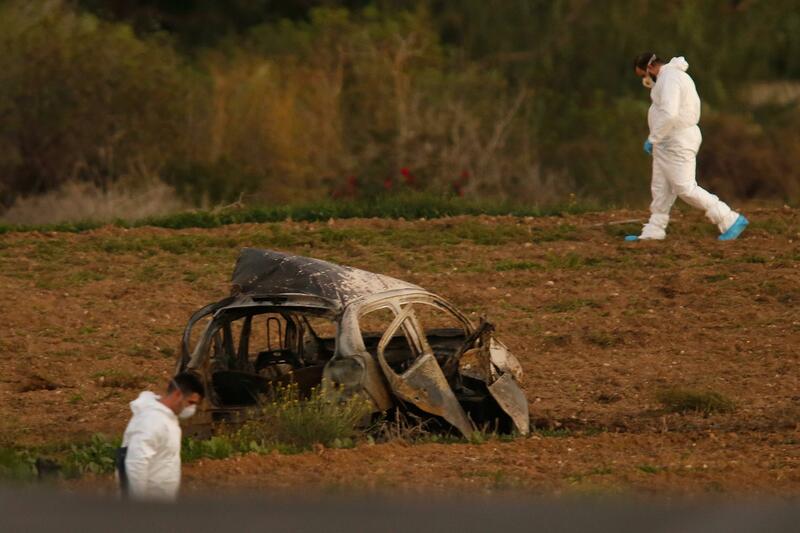 VALLETTA, Malta -- A Maltese investigative journalist who exposed the island nation's links to offshore tax havens through the leaked Panama Papers was killed Monday when a bomb exploded in her car, the prime minister said. Caruana Galizia's death resulted from a "barbaric attack" that also amounted to an assault on freedom of expression, Muscat said. He said the journalist "was one of my harshest critics, on a political and personal level" as he denounced her slaying. One of the topics she examined was the Maltese content in the Panama Papers leaked in 2016. She wrote that Muscat's wife, the country's energy minister and the government's chief-of-staff had offshore holdings in Panama to receive money from Azerbaijan. The slain journalist had written a twice-weekly column for The Malta Independent since 1996 and wrote a blog, "Running Commentary." A half hour before she was killed, she posted to her website an item about a libel claim the prime minister's chief of staff had brought against a former opposition over comments the latter made about corruption. Monday evening's Parliament session was scrapped, except for briefings about the bombing given by Muscat and Delia, who called the reporter's slaying a "political murder." The day after his mother was killed Matthew posted a long, graphic statement on Facebook, where he described seeing his mother's body parts on the ground after the explosion. He blamed a "culture of impunity" in the Maltese government, which he said punishes the expression of basic freedoms, as being at the root of his mother's killing. "A few hours later, while that clown of a Prime Minister was making statements to parliament about a journalist he spent over a decade demonising and harassing, one of the police sergeants who is supposed to be investigating her murder, Ramon Mifsud, posted on Facebook, 'Everyone gets what they deserve, cow dung! Feeling happy :)'," said Matthew in his post. Caruana Galizia's family has asked the Courts of Malta to replace the magistrate assigned to conduct the inquiry into the journalist's death. The family said the magistrate, Consuelo Scerri Herrera, "in her personal capacity, had launched judicial procedures against (Caruana Galizia) regarding comments she had written." Caruana Galizia for many years was a harsh critic of Malta's Labor party and government. More recently she had expanded her criticism to include the opposition Nationalist Party. "Daphne played a vitally important role in unearthing serious allegations of money laundering and corruption in Malta, including those involving senior figures in the Maltese government," said Sven Giegold, a Greens member in the European Parliament. Italian newsweekly L'Espresso, which has also written about alleged corruption linked to Malta, said the reporter's murder demonstrated that a well-documented expose' "is perceived as a danger by the powerful and by organized crime." European Parliament President Antonio Tajani in a tweet called the development a "tragic example of a journalist who sacrificed her life to search for the truth."